Cancer is one of the leading causes of death, resulting in more than 8.2 million deaths annually worldwide . Chemotherapy, despite its severe side effects, is still one of the most effective treatments for tumor therapy owing to its ability to eradicate disseminated cancer cells and retard recurrence [2-4]. However, a big challenge in the clinical application of chemotherapy is the drug resistance that occurs shortly after the treatment. Even worse, in many cases, cancer becomes simultaneously resistant to a spectrum of chemotherapeutics that are different in structure and mechanism, termed multidrug resistance (MDR) . It is estimated that MDR is responsible for over 90% of treatment failures in patients, and the surviving cancer cells do not respond to drugs, leading to tumor recurrence and progression . Multiple mechanisms of tumor resistance have been explored [5, 7, 8], which can be grouped into: a) overexpression of ATP-binding cassette pumps (e.g., P-glycoprotein, P-gp); b) defective apoptotic mechanisms; c) structural alterations of the drug targets; d) repair of the damaged DNA; and, e) detoxicity of the drugs by certain enzymes. In addition to these changes at the molecular level, the tumor microenvironment also plays key roles in the development of MDR . For instance, the abnormal vascular and lymphatic systems induce high intratumoral pressure and hypoxia, which further limit drug penetration into the tumor [10-12]. Therefore, it is necessary to develop new vehicles that can deliver chemotherapeutics deep into the tumor and possess capabilities to overcome MDR resulting from molecular changes in cancer cells. In order to realize the principle goal of reversing MDR, various strategies are currently applied, such as radiotherapy and surgical resection, which are limited by serious adverse reactions with low compliance and early tumor treatment without metastatic lesions, respectively. Combinational therapy with small molecule inhibitors and gene therapy towards resistant tumor cells are also exploited. Nevertheless, conventional dosage forms lack selective targeting and deep penetration, resulting in severe systemic toxicity and an inefficient lethal threshold. Therefore, nanoparticles are the most explored vehicles to combat MDR [6, 13-15], including liposomes [16, 17], micelles [18, 19], gold nanoparticles [20, 21], magnetic nanoparticles [22, 23], carbon nanotubes [24, 25], dendrimers , mesoporous silica nanoparticles [27, 28] etc. These nanoparticles can deliver agents either chemically grafted or physically encapsulated specifically to cancer cells , taking advantage of the enhanced permeability and retention (EPR) effect in the tumor and ligand-receptor-mediated active targeting. However, their efficacy is still impeded by limited accumulation and poor penetration in the tumors  because nanomedicines with prolonged circulation and retention are not preferred for tumor penetration and cellular entry . Furthermore, the non-specific drug release from nanoparticles during circulation and insufficient drug release in the cancer cells are also problematic. Stimuli-responsive nanomedicines have thus been developed with the aim of modulating the tumor microenvironment-triggered transitional properties of nanomedicines for enhanced tumor penetration, and to initiate drug release in the tumor with precise spatial and temporal control (Fig. 1) [30, 32, 33]. In this work, we highlight the current progress of various nanomedicines with different stimuli-responsive capabilities for overcoming MDR. The materials, design, construction as well as efficacy in overcoming MDR of these nanomedicines are discussed. Although nanoscale delivery systems would significantly enhance drug accumulation in tumor sites by the EPR effect, insufficient drug concentration still occurs due to a series of barriers existing in the drug-resistant tumor microenvironment, poor drug release inside tumor cells as well as drug efflux pumps. Tumor cells in an environment with sub-lethal drug concentration could result in acquired resistance. To circumvent this problem, rapid drug release is crucial to provide optimum drug concentrations and destroy tumor cells before they acquire the capability to exclude chemotherapeutics [34, 35]. Thus, stimuli-sensitive nanoparticles have been developed through the design of materials recognizing endogenous or exogenous stimuli to rapidly trigger drug release . Schematic diagram of the dynamic response progress of intelligent nanoparticles. (A) Example of pH-responsive nanoparticles loaded with small molecule inhibitors disintegrating in the acidic endosomal environment with triggered-release of the cargo to inhibit P-gp function. (B) Redox-responsive nanoparticles with loaded siRNA and drug collapsing under GSH rich condition via disulfide bond cleavage. (C) Light-triggered nanoparticles with photosensitizer could increase the temperature in tumor sites via photothermal therapy (PTT) or generate reactive oxygen species (ROS), leading to endosomal disruption and abundant drug release. (A) Schematic illustration of PEG-MnO2 construction. 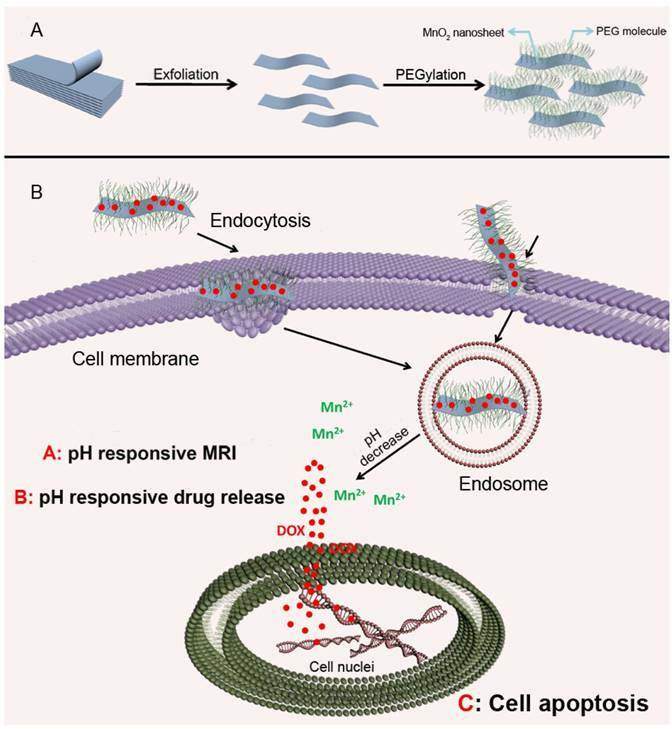 (B) The intracellular procedure of the nanosheets for pH-sensitive drug release and magnetic resonance imaging (MRI). Adapted with permission from Ref . Copyright 2014 Wiley-VCH. It has been reported that a pH gradient exists between intracellular and extracellular compartments in tumors, which results from the rapid proliferation and growth of tumor cells exceeding blood transportation, causing an inadequate supply of nutrients and oxygen, and thus generating lactic acid due to glycolysis . Given the acidic tumor microenvironment, pH-responsive nanoparticles are considered as the most skillful strategy to achieve reversal of MDR. These nanomedicines remain stable at physiological pH, but collapse in an acidic microenvironment due to hydrolysis of acid labile bonds or protonation of chemical groups, resulting in release of their cargo into the cytosol, which promotes cytoplasmic drug concentrations to exceed the capacity of the efflux transporters . Chen et al. introduced a theranostic platform based on polyethylene glycol (PEG) modified MnO2 nanosheets for ultrasensitive pH-triggered magnetic resonance imaging (MRI) as well as rapid drug release to circumvent MDR . The chemically exfoliated 2D MnO2 nanosheets were modified with amino-polyethylene glycol through Mn-N coordinate bonding, which are stable under physical conditions but break up in the acidic tumor tissues. The MnO2 nanosheets having large surface areas can promote drug loading efficiency (Fig. 2). Intracellular acidity-triggered disintegration of the nanosheets rapidly released loaded doxorubicin (DOX) and Mn2+, and the latter enabled T1-MRI capabilities for tumor imaging and detection. In addition, MnO2 nanosheets can bypass P-gp pumps due to the larger size of the 2D nanosheets than free DOX. He and co-workers reported that the efficiency of paclitaxel (PTX) towards sensitive and MDR tumor cells could be significantly potentiated when it was delivered by nanoparticles fabricated from acetylated α-cyclodextrin (Ac-aCD) materials . 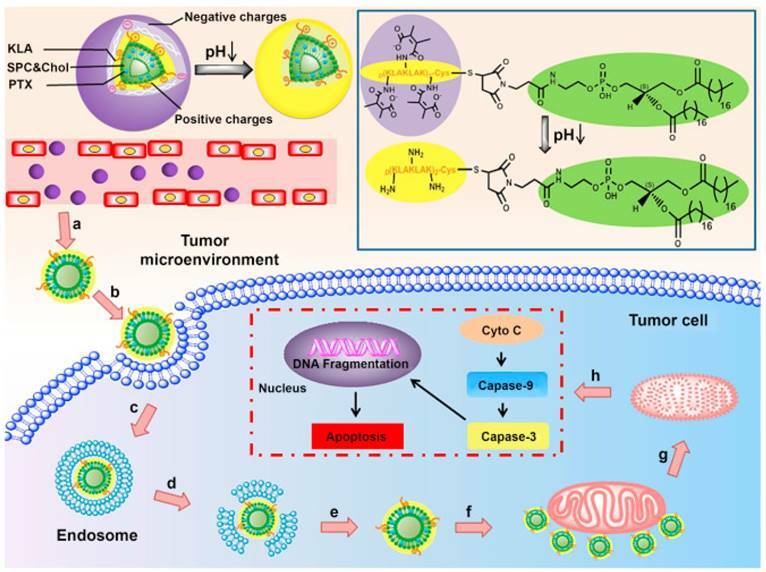 Therefore, in their later work, they fabricated a pH-responsive nanoparticle based on Ac-aCD, which could deliver α-cyclodextrin into the cytoplasm via pH-triggered hydrolysis of Ac-aCD, thus improving the anticancer efficacy of various chemotherapeutics in MDR tumor cells . RNA interference technology has shown great potential for cancer therapy due to its sequence-specific gene silencing effect to knock out MDR genes, reducing MDR-related protein (e.g., P-gp) expression . However, siRNA delivery to tumor cells is hampered by its poor stability due to degrading enzymes and rapid clearance from the circulation [43, 44]. Therefore, siRNA encapsulated in stimuli-responsive nanoparticles could achieve not only timely release into the cytoplasm, but also be delivered into drug-resistant cells to suppress P-gp expression, which in turn promotes drug concentration . 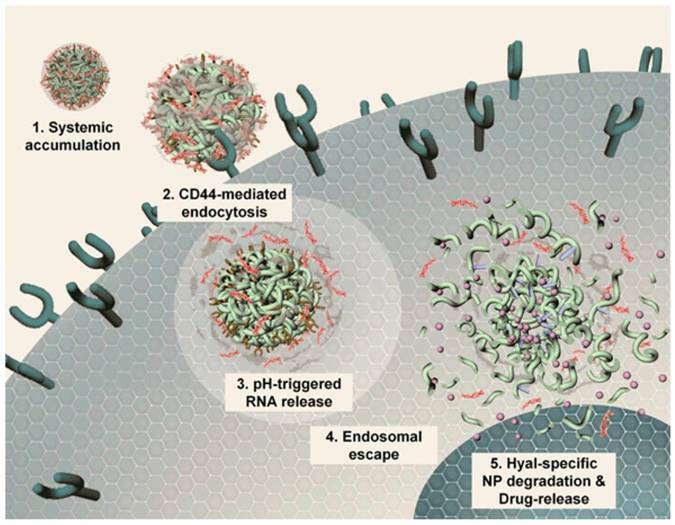 Most gene delivery systems employ nanoparticles with positive charge complexing or that are chemically modified with RNAs for intracellular delivery. Chio and colleagues developed a highly anionic polymer based on hyaluronan-5β-cholanic acid (HA-CA) conjugation, with an engineered artificial RNA receptor Zn(II)-dipicolylamine (DPA/Zn) for RNA loading via interaction between zinc ions of DPA and phosphates of RNA . Furthermore, calcium phosphate (CaP) was added as the surface layer of the nanoformulation to avoid nonspecific interaction with phosphate anions in the phosphate-rich physiological condition. After endocytosis into tumor cells via CD44-mediated active targeting, the outer layer of CaP is dissolved in the acidic environment, leading to system unshielding, consequently triggering MDR1-target siRNA release (Fig. 3). Moreover, the nanocarrier can be collapsed by HA enzymes in tumor cells for drug release. The authors substantiated that this versatile nanoplatform obviously reduced MDR1 mRNA and P-gp expression, indicating that an effective therapeutic concentration can be achieved in drug-resistant cells. Mechanistic illustration of pH- and enzyme-sensitive nanoparticles. (1, 2) The nanoparticle encapsulating both RNA and chemotherapeutics accumulates in lesion sites and enters cells via CD44-mediated endocytosis. (3) RNAs released from this system in late endosomes or early lysosomes via pH-triggered CaP layer disintegration. (4) Proton sponge effect causes endosomal escape of RNA, leading to RNA distribution into the cytosol for targeting genes. (5) HA enzyme degradation of the nanoparticle causing complete collapse of the nanostructure and release of all the cargoes. Adapted with permission from Ref . Copyright 2014 American Chemical Society. In addition, up-regulation of anti-apoptotic protein expression also induces non-pump-related drug resistance due to blockade of cell apoptosis . Therefore, siRNA or small hairpin RNA (shRNA) are employed to downregulate anti-apoptotic genes (e.g., BCL-2 or survivin) to facilitate the death of tumor cells and recover sensitivity to chemotherapeutics . Tang et al. reported pH-triggered nanoparticles based on poly(β-amino ester), poly[(1,4-butanediol)-diacrylate-β-5-polyethylenimine]-block-poly[(1,4-butanediol)-diacrylate-β-5-hydroxy amylamine] (PDP-PDHA), co-loaded with DOX and survivin shRNA . 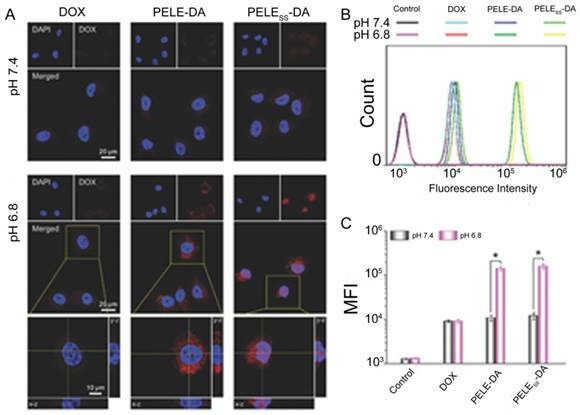 This nanoplatform endowed the ability of pH-triggered release and enhanced endo/lysosomal escape, causing increased intracellular DOX accumulation by 10.4-fold and promoting transfection efficiency in MCF-7/ADR cells. These results showed a synergistic effect of DOX and apoptotic shRNA in pH-sensitive nanoparticles for overcoming MDR. Many efforts have been made directly towards P-gp inhibition via small molecule drugs such as verapamil (VER) [50, 51] and cyclosporine A [52, 53] to restore sensitivity of resistant cancer cells. A combination of various chemotherapeutic drugs into a single platform are often used to prevent P-gp pumping out. In comparison, with an intelligent nanoplatform, encapsulated drugs can be burst- and quick-released in drug-resistant cells at an optimal ratio, resulting in increased intracellular accumulation, which has been attributed to P-gp suppression and hence increased efficiency of chemotherapy . Furthermore, it has been demonstrated that the inhibitors should be unloaded earlier and faster than chemotherapeutics to suppress efflux pumps in advance, subsequently achieving a lethal concentration of drugs for efficient therapy. Duan et al. designed a pH-triggered micelle system in which the molecule inhibitor and apoptosis inducer, disulfiram (DSF), was physically encapsulated in the core, while the chemotherapeutic, DOX, was conjugated with the carrier material via an acid-cleavable hydrazone bond . These micelles released their cargoes in a temporal manner: DSF was released earlier to inactivate P-gp activity, while DOX was released by hydrolysis of hydrazone bonds and accumulated in cancer cells to realize MDR reversal (Fig. 4). Additionally, small molecule inhibitors, including arsenic trioxide (ATO, As2O3), are utilized for preventing DNA repair. ATO with high cytotoxicity is approved by the FDA for treatment of acute promyelocytic leukemia, but its utilization in cancer therapy is still hampered due to poor bioavailability and undesirable side effects. Hence, ATO loaded in stimuli-responsive nanoparticles is expected to overcome these disadvantages by enabling high drug concentrations in tumor cells and reducing side effects [56, 57]. ATO is considered a DNA damage repair inhibitor, and has been co-delivered with DOX, a DNA damage inducer, via a pH-sensitive silica nanocarrier to kill drug-resistant cells . On the one hand, these intelligent nanoparticles enable increased accumulation and controlled drug release in DOX-resistant cells; on the other hand, ATO could inhibit the activity of DNA repair protein PARP-1 and provide efficient DOX concentrations that cause cell apoptosis. ATP-dependent drug efflux is the principal mechanism resulting in MDR occurrence. Thus, mitochondrial targeting for ATP depletion could solve this problem from the source. Mitochondria, an indispensable energy-generation cellular organelle for energy supply, is also implicated in programmed cell death especially in tumor cells . Cytochrome c (Cyto c) is released from mitochondria to the cytoplasm, leading to activation of initiator caspase-9 and effector caspase-3, thus causing mitochondria-dependent apoptosis . Jiang et al. reported a peptide D[KLAKLAK]2 (KLA) modified dual-functional liposome system with pH-sensitive and mitochondrial targeting characteristics that was fabricated for enhanced apoptosis of A549 cells and A549/Taxol cells . The liposome could reverse its surface charge from negative to positive to facilitate internalization. Afterwards, the KLA peptide lead to selective targeting and cargo accumulation in mitochondria (Fig. 5). Meanwhile, PTX could interfere with microtubule dynamics by microtubule targeting and interaction with β-tubulin. Aberrant metabolism of malignant tumor cells plays a crucial role in affording anabolic energy demands . The glutathione (GSH) concentration in tumor cells is much higher (100-1000 times) than in the extracellular fluids, especially in drug-resistant cells . Hence, such significant differences have made redox-responsive delivery systems gain great attention for intracellular drug release via thiolysis in the presence of GSH . The commonly utilized reducible linkers include disulfide bonds [65-67], thioether bonds  and diselenide bonds . The disulfide bond is the most common and simplist method, and they can be inserted into the material of carriers, acting as a linker between two blocks of polymers [70-74], as well as a linkage to bind agents or ligands to carriers [75-77]. With cleavage of the disulfide bond, the nanoparticles could be disintegrated due to structural transformation. Ma and co-workers introduced a polyphosphate-based micelle, which was composed of diblock copolymers with a hydrophilic PEG block and a hydrophobic polyphosphoester (PPE) block bearing a disulfide bond in a side group (Fig. 6) . After the micelle is internalized by MDR tumor cells, the disulfide bond is cleaved, resulting in a hydrophobic to hydrophilic transition of the PPE block, disassembly of the micelles, as well as drug unloading. Wang et al. reported a kind of redox-activatable micelle based on PEG, ATP-depleting Pluronic P123 and polyethyleneimine (PEI) blocks via disulfide bond connection, co-loaded with anticancer drug PTX and siRNA for polo-like kinase1 (PLK1) targeting to down regulate ATP and interfere with metabolism of tumor cells for MDR prevention . This system was activated in GSH-rich milieu, leading to not only increased PTX and siRNA release but also triggering fast ATP-depletion to prevent drug efflux. Furthermore, thiol-containing drugs loaded into nanoparticles is another strategy to show GSH-triggered drug release. For example, Wang et al. developed a dendrimer-encapsulated gold nanoparticle and utilized it as a carrier for encapsulating thiolated anticancer drugs . (A) Schematic illustration of nanoparticles loaded with disulfiram (DSF), from which DSF released faster than DOX to inhibit efflux pumps. (B,C) Mean fluorescence intensity of DOX that accumulated in MCF-7/ADR cells and MCF-7 cells after incubation with different formulations. (D,E) The amount of intracellular DOX in MCF-7/ADR and MCF-7 cells after incubation with different formulations for 4 h, and then culturing in fresh medium for different times. Adapted with permission from Ref . Copyright 2013 American Chemical Society. Illustration of the composition and structure of pH-sensitive liposomes for mitochondria targeting. (a,b) The liposomes accumulated in tumor sites via the EPR effect and exhibited charge reversal by the acidic tumor microenvironment. (c,d,e) Internalization, endosomal escape and cytoplasmic release of the liposomes. (f) Liposomes combined with mitochondria via KLA peptide targeting. (g,h) Mitochondria damage and the mechanisms of the mitochondria apoptotic pathway. Paclitaxel (PTX) is released from the liposomes in mitochondria and triggers the release of cytochrome c (Cyto C). Adapted with permission from Ref . Copyright 2015 Elsevier Ltd. The degradation of tumor extracellular matrix is responsible for tumor metastasis and proliferation. Matrix metalloproteinase (MMP) and other proteolytic enzymes secreted by tumor cells degrade the membrane basement, resulting in thin, interrupted and even defective states, which enhance tumor metastasis and make cancer difficult to eradicate, thereby causing tumor resistance. Since some enzymes are overexpressed in MDR cancer cells, such as protease , phospholipase  and glycosidase , enzyme-responsive nanoparticles are an emerging strategy to deliver chemotherapeutics to tumor cells selectively and effectively. Among all the specific enzymes in MDR tumors, MMP is one of the most promising substrates utilized as the mechanism for controlled-release of enzyme-responsive systems. According to this strategy, Liu and co-workers developed a nanoplatform woven from a peptide network, the shell of which was formed from enzyme-degradable polymeric peptides anchored to the core covalently . Alternatively, a peptide chain with a specific sequence can be an MMP-sensitive linker to conjugate agents to the carrier [85, 86]. Dai et al. proposed a new type of copolymer (PEG2k-pp-PE), which showed even higher capability of P-gp inhibition than d-α-tocopherol polyethylene glycol succinate (TPGS) . This copolymer is capable of both MMP2-sensitive drug delivery and inhibition of P-gp-mediated drug efflux, achieving high tumor targeting as well as MDR reversal. The endogenous triggers in tumor cells have higher profiles than normal cells. But there are still some enzymes, reductases, as well as acidic organelles in normal cells, which would lead to unexpected accumulation in normal tissues and drug release with side effects. Hence, more precise targeting and triggered drug release need to be further explored and controlled. (A) The construction of redox-responsive micelles. The micelle is disintegrated via the cleavage of disulfide bonds by glutathione (GSH). (B) Cellular uptake and intracellular responsive process of the micelles. Doxorubicin (Dox) is released after the cellular entry of the micelle. Adapted with permission from Ref . Copyright 2015 American Chemical Society. Solid tumors with several physiological barriers, such as high interstitial pressure and a dense extracellular matrix, to a great extent affect the uptake of nanoparticles and tumor penetration. Photothermal therapy (PTT) has attracted much attention to overcome these barriers for hyperthermia damage to cancer cells, enhanced tumor penetration of nanoparticles as well as triggered release of cargoes . Moreover, PTT has been substantiated to augment the cytotoxicity of some chemotherapeutics, leading to promoted efficiency using the same dosage of drugs . It has been reported that many materials, such as gold particles [90, 91], carbon nanotubes  and grapheme  have a powerful photothermal effect owing to their strong ability to absorb near-infrared (NIR) laser and transform it into heat for tumor ablation and deep penetration to achieve on-demand release in drug-resistant malignant cells . However, the light penetration depth is still an obstacle restraining their application for deep tissues. Therefore, it is more efficient for superficial tumors. Additionally, photodynamic therapy (PDT) is another strategy for more selective therapy towards MDR tumor cells. The photosensitizer, such as pyrolipid , chlorin e6 (Ce6) [96, 97], NaYF4:Yb/Tm-TiO2 inorganic photosensitizers , oligo(p-phenylene vinylene) derivative (OPV) , is a key component in the light-sensitive nanocarrier. They can be activated by light, producing reactive oxygen species (ROS), which can not only kill cancer cells directly  but also induce oxidation of membranes and affect the permeability of cell membranes, which is beneficial for anticancer drug penetration  (Fig. 7). Also, the system can utilize the ROS inducibility of the material itself and trigger ROS release. TPGS has been applied not only as an efficient P-gp inhibitor but also as an ROS inducer via its interaction with mitochondria respiratory complex II . Wang and co-workers proposed that dispersible hollow carbon nanospheres (aHCSs) combined with NIR laser irradiation for DOX delivery could realize MDR reversion . Irradiating HCSs to generate free radicals resulted in a large production of heat shock factor-1 protein homotrimers, thus suppressing resistance-related genes. Furthermore, with the aid of laser irradiation, DOX release and permeability into the nucleus could be promoted. 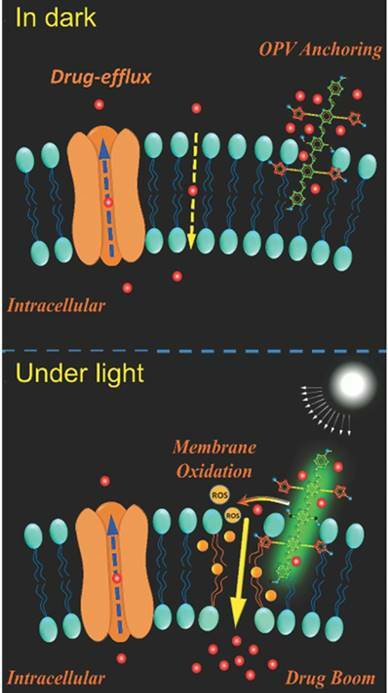 Mechanisms illustration of light-induced ROS generation by photosensitizer. The membrane permeability can be enhanced via membrane oxidation in the presence of oligo(p-phenylene vinylene) (OPV) under irradiation. Adapted with permission from Ref . Copyright 2014 Wiley-VCH. Nitric oxide (NO) plays a pivotal role in the physiological and pathological process and acts as a potential anticancer agent. High concentration of NO can directly kill cancer cells through oxidation or nitrosation of mitochondria and DNA, while a low concentration of NO can significantly inhibit the P-gp expression in MDR cancer cells . Hence, a series of investigations involving light-triggered NO generation have been proposed to overcome MDR. Fan and colleagues constructed biodegradable nanoparticles co-loaded with BNN6/DOX, which exhibit on-demand NO gas release via NO donor BNN6 upon ultraviolet-visible irradiation. Notably, with NO generation the nanoparticle shell broke, thus enhancing release of DOX, leading to significant gas/drug effect against MDR . 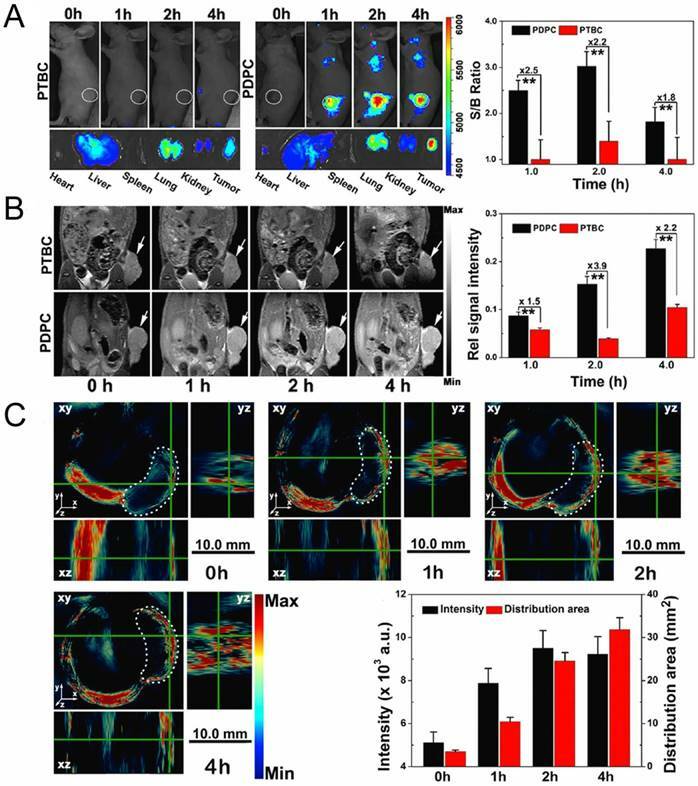 Magnetic-guided tumor targeting, utilizing magnetic nanoparticles assisted with an external magnetic field focused on lesion sites, has increased as a strategy for specifically enhancing drug accumulation in MDR tumors and MRI . Magnetic nanoparticles are usually modified with iron oxide  or manganese oxide  to reverse drug-resistant tumor cells under the guidance of magnetic field. It was reported that DOX-loaded magnetic silk fibroin nanoparticles (SFNs) were prepared easily by adding silk fibroin solution into potassium phosphate solution dispersed with DOX and magnetic Fe3O4 nanoparticles (MNPs). The superparamagnetic MNPs not only provide magnetism for SFNs but also realize the artificial regulation of SFN formation and DOX entrapment behavior . 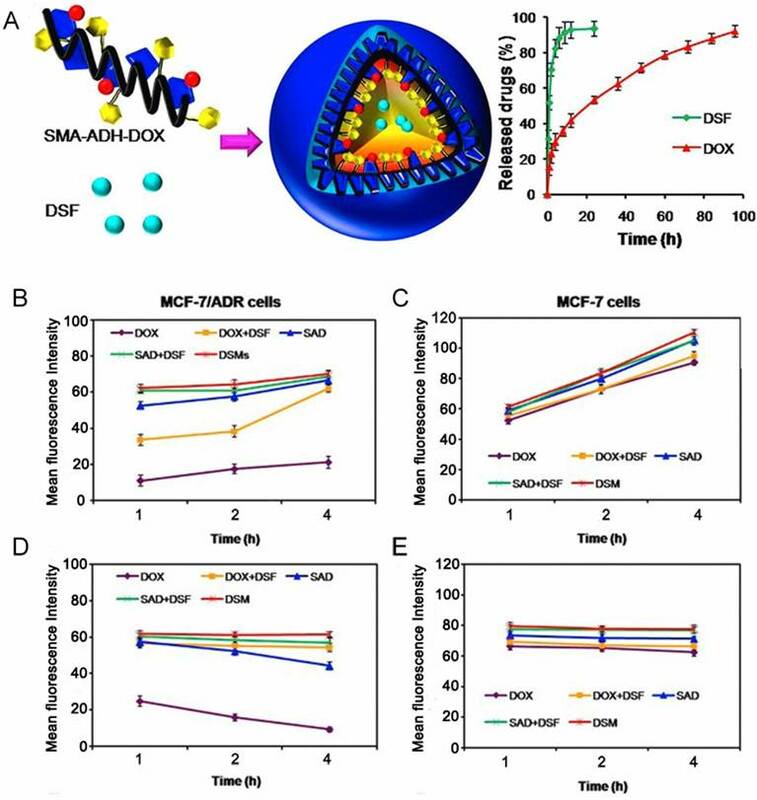 This magnetic-guided drug delivery showed significantly higher accumulation in MCF-7/ADR cells and more cytotoxicity to drug-resistant cells than free DOX at the same dosage. For magnetic-triggered nanomedicine systems, the external magnetic field is crucial to guide nanoparticles to accumulate at lesions. The frequency and time of exposure require optimization for various nanoparticles. Ultrasound possesses several superiorities such as non-invasiveness, low cost, good penetration depth by tuning the frequency, duty cycle and time of exposure, as well as the absence of ionizing irradiation . Acoustic microbubbles (MBs) have been developed to combine with ultrasound for drug delivery [111, 112]. Under proper sound pressure, MBs could oscillate and collapse rapidly. The shear stress generated from MBs can help to create transient pores in the cell membrane and enlarge the capillary gaps, leading to enhanced EPR effect, which is called ultrasound-mediated microbubble destruction . 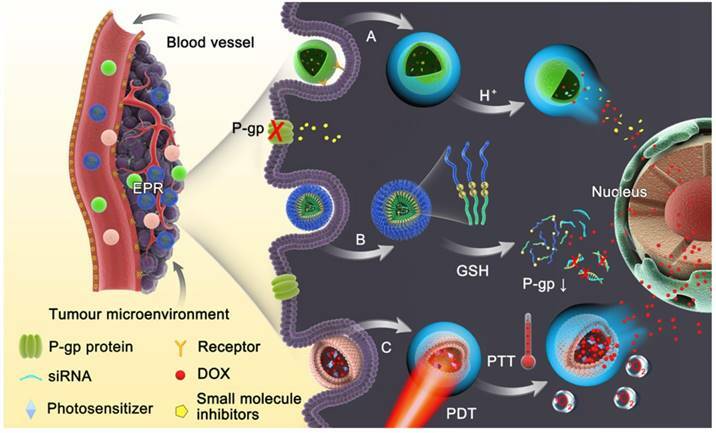 Yin and co-workers designed a nanoscale microbubble loaded with both chemotherapeutic PTX and siRNA targeting antiapoptosis genes (BCL-2) . Under a low-frequency ultrasound imposed on the lesion site, co-delivery of payloads and higher accumulation were achieved. PTX-NBs/siRNA simultaneously overcame efflux pump-mediated drug resistance and antiapoptosis-related drug resistance. Hypoxia has long been considered a potential contributor to MDR by causing the emergence of cancer stem cells (CSCs)  having the ability to differentiate into a bulk of tumor cells and renew themselves, thus possessing unlimited potential for tumor growth and proliferation. This would lead to cancer recurrence, more malignance and resistance to therapeutic agents . Therefore, triggered oxygen generation in tumor tissues would overcome hypoxia-mediated cancer resistance. Song et al. modulated the hypoxic tumor microenvironment using nano-perfluorocarbon (PFC) as an oxygen shuttle for oxygen delivery . With a low-power adapted ultrasound, PFC nanodroplets absorbed oxygen in the lung and released oxygen in the tumors, then circulated back to the lung for reoxygenation (Fig. 8). This system provided an artificial blood oxygen shuttle to relieve the hypoxia-associated drug resistance. In addition to these strategies to relieve tumor hypoxia, some treatments have also utilized hypoxia-activated nanomedicines, which exhibit toxicity only to tumor cells. However, tumor cells around the tumor vasculature have sufficient oxygen supply, which would result in unsatisfying effect. Therefore, a potential method is to combine hypoxia-activated nanomedicines with other therapeutics for efficient MDR reversion. Although ultrasound-based technology with nanomedicines has displayed preferable advantages, the detrimental effects of ultrasound should also get more attention. The optimal intensity, frequency, duty cycle and time of exposure need to be selected for various expectations. It is necessary to use the lowest amount of energy for minimal side effects, yet a certain amount of energy is better for efficient outcomes. Hence, safety, biocompatibility, and the balance between less damage and sufficient energy remain challenges for further control. Stimuli-responsive nanoscale systems are considered ideal carriers since the systems are responsive for high drug loading, more precise targeting without premature leakage, rapid drug unloading via accurate temporal and spatial control, as well as higher accumulation at lesions. Although single stimuli-responsive systems can improve tumor targeting and MDR recovery to some degree, considering the complexity of the tumor microenvironment and sophisticated physiological barriers in the human body, a series of multi-responsive nanomedicines have been designed to improve the performance of nanoscale systems further. Notably, they respond to a combination of two or several stimuli simultaneously at the same sites or in a sequential manner in different locations . To overcome sequential pathological barriers existing in MDR tumors, recently, Wang et al. reported acidity-triggered ligand-presenting (ATLP) nanoparticles to facilitate tumor penetration and inhibit drug efflux for MDR tumor therapy . The ATLP nanoparticles dissociated in the acidic tumor microenvironment and subsequently presented iRGD ligand, which bound to neuropilin-1 receptor for enhanced cellular uptake. Afterwards, P85 and DOX w5555ere released by MMP-2 cleavage for P-gp inhibition and tumor killing, respectively. In addition, with NIR laser irradiation, the nanoparticle generated remarkable ROS in the presence of Ce6, resulting in gene expression profile alteration to circumvent drug resistance (Fig. 9). Representation of an oxygen nanoshuttle. PFC acted as an oxygen-loading carrier to bring cargoes from the lung and unload oxygen at the tumor site under ultrasound (US). The relief of hypoxia in the tumor can potentiate the therapeutic outcomes of radiotherapy (RT) and photodynamic therapy (PDT). Adapted with permission from . Copyright 2016 American Chemical Society. Tumor penetration of the ATLP nanoparticles in MCF-7/ADR multicellular spheroids. 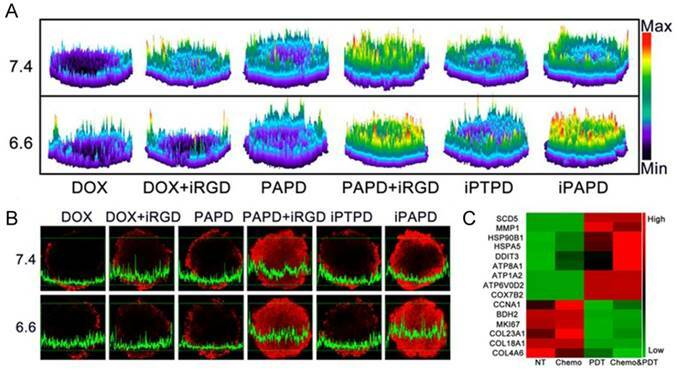 (A) 2.5D images and (B) confocal laser scanning microscopy images of DOX distribution in tumors when incubating with different formulations. (C) Gene expression alterations in MCF-7/ADR cells. Genes related to metabolism and intracellular transport were up-regulated, while genes involved in cell proliferation and division, as well as extracellular matrix proteins were down-regulated. Adapted with permission from Ref . Copyright 2017 American Chemical Society. Some anticancer drugs are more efficient when engulfed into the nucleus by targeting DNA [121, 122]. Therefore, nanoparticles with the ability to deliver chemotherapeutics into the nucleus and promote drug accumulation would be favorable for combating MDR. Guo et al. developed a dual-sensitive size changeable micelle with core-shell structure, which exhibited significant efficacy for overcoming drug-resistant breast cancer . In the acidic pH condition, size increase and charge reversal occurred, which lead to enhanced retention without blood elimination and cell internalization by electrostatic interactions. After lysosomal escape of the micelle, the shell structure disintegrated via breakage of disulfide bonds under the higher GSH concentration in tumor cells, producing micelles with smaller sizes for nuclear entry. As a result, more DOX accumulated intranuclearly to cause DNA damage and block DNA replication. Promoted cellular uptake of this dual-sensitive micelle and intranuclear drug accumulation were obviously observed in MCF-7/ADR after incubation with this micelle (Fig. 10). The results demonstrated that this intelligent micelle could overcome tumor MDR. Similarly, siRNA and chemotherapeutic unloading at the same sites would not exert good coordination between the payloads. Only when siRNA departs from the vehicle in the cytosol earlier or faster to silence drug resistance genes is the chemotherapeutic agent better able to be transported into the nuclei for killing the tumor. According to this consideration, Han and colleagues developed a pH-/redox-sensitive delivery system to solve this problem . They designed multi-layered nanocomplexes based on the positive/negative/positive structure via electrostatic self-assembly. siRNA was chemically encapsulated via disulfide bonds on the outer layer with galactose modified, acid-sensitive poly(allylamine hydrochloride)-citraconic anhydride serving as the inner layer for structural disassembly and endosomal/lysosomal escape, and the core being based on mesoporous silica nanoparticles functionalized with TAT peptide for DOX loading. GSH breaks the disulfide bond and facilitates siRNA release in the cytoplasm, while delivering the cores into the nucleus by recognition of TAT peptide. This system realized the precise delivery of DOX and siRNA to nuclei and cytosol, respectively, and unloaded them sequentially. External stimulus provides a new opportunity to easily control delivery and cargo release at desired times and sites, as well as imaging for tumor diagnosis. Yu and co-workers prepared pH and NIR light dual-responsive micelles for DOX resistance reversion in breast cancer . 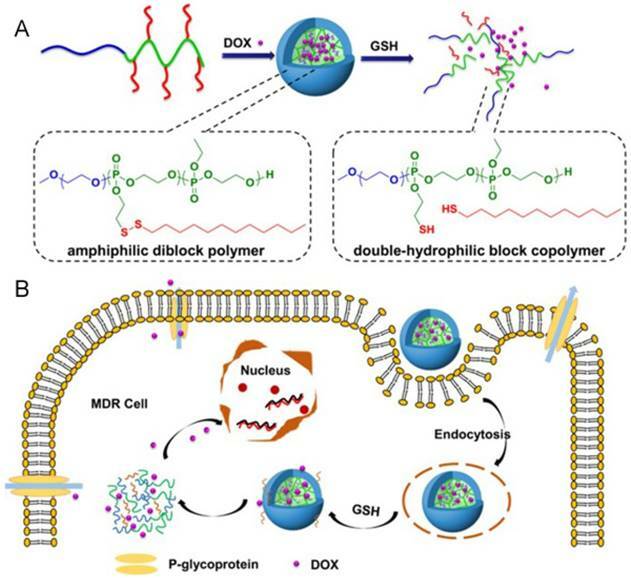 These micelles consisted of a pluronic copolymer P123-conjugated DOX prodrug (P-DOX), a poly(ethylene glycol)-block-poly(diisopropanolamino ethyl methacrylate) (PEG-b-PDPA) diblock copolymer as the micelle matrix, and grafted dye cypate as an NIR light-triggered moiety. It was demonstrated that the micelles were stable during blood circulation, but collapsed in acidic endosomes owing to protonation of PDPA. With NIR irradiation, the micelles could promote tumor penetration and drug release by the hyperthermia effect. In their later work, they applied another photosensitizer (Ce6) for PDT to produce ROS as well as for multimodal tumor imaging . This system possesses the superiorities of fluorescence, MRI and photoacoustic (PA) imaging for tumor diagnosis and combinational treatment of drug-resistant tumor (Fig. 11). Stimuli-responsive nanomedicines provide a promising opportunity to trigger drug release in an on-demand manner and display various superiorities over conventional nanomedicines to combat MDR. However, there are still some obstacles for their application in clinical therapy. The complexity of tumor tissues is far beyond our imagination. Tumor cells and their drug-resistance mechanisms are highly heterogeneous, which may cause different effects according to various conditions. Hence, individualized therapy is on the way for more precise treatment towards cancer and MDR. Furthermore, nanoparticles triggered by endogenous stimulus accumulate in lesion sites largely dependent on the EPR effect, where the high interstitial pressure could inhibit the in-flow of chemotherapeutics into tumor tissue. Additionally, in normal tissues there are still present background level enzymes and reductases similar to those in tumor microenvironments. Also, the good permeability of tumor vasculature is mainly constructed in experimental animal models, but in practice, the growth rate of tumors in the human body is relatively slower than that in animal models, resulting in an unsatisfied EPR effect. Therefore, it is urgent to improve the progression of active targeting to tumors via ligand-mediated or exogenous stimulus. In contrast, the exogenous-responsive nanomedicines could achieve more precise drug release, and avoid premature leakage during blood circulation. Nevertheless, the biocompatibility, biosecurity and patient compliance of the nanoparticles are still on the way to further exploration. On the other hand, stimuli-responsive nanoparticles are limited to preclinical studies for the most part. The sophisticated process of their preparation and unexpected physiological dilemmas also restrict their application in the clinic for tumor therapy and MDR reversion. Additionally, deep exploration of the mechanisms of MDR is desired; therefore, it is more efficient to combine these studies with various stimuli-responsive nanomedicines. Stimuli-responsive nanoparticles would provide a universally applicable platform, with the cargoes playing important roles for MDR reversion. To address the issue of tumor heterogeneity, neoantigens of specific tumors are required for screening for personalized therapy. Therapeutic vaccines are a boosting strategy for cancer immunotherapy; therefore, with intelligent nanoparticles, therapeutic vaccines would exhibit more superiorities for MDR reversion as well as cancer therapy. In addition, the materials of intelligent nanoparticles must be biocompatible and biodegradable with low toxicity, the processes of nanoparticle preparation needs to be simplified and the nano-based technology needs to mature, to be beneficial for clinical translation. Intracellular distribution and cellular uptake of different formulations. (A) CLSM examination and (B) flow cytometry studies of different formulations after incubation with MCF-7/ADR cells at pH 7.4 and 6.8 for 6h. (C) Mean fluorescence intensity of MCF-7/ADR cells incubated with different formulations at pH 7.4 and 6.8. Adapted with permission from Ref . Copyright 2015 Wiley-VCH. Fluorescence (A), T1-weighted MRI (B) and PA images (C) of MCF/ADR tumor-bearing mice after administration of acid-switchable PDPC micelles and PTBC micelles without pH-responsive property. Adapted with permission from Ref . Copyright 2016 American Chemical Society. MDR: multidrug resistance; P-gp: P-glycoprotein; EPR effect: enhanced permeation and retention effect; PEG: polyethylene glycol; MRI: magnetic resonance imaging; DOX: doxorubicin; PTX: paclitaxel; Ac-aCD: acetalated α-cyclodextrin; HA-CA: hyaluronan-5β-cholanic acid; DPA/Zn: Zn(II)-dipicolylamine; CaP: calcium phosphate; shRNA: small hairpin RNA; PDP: poly[(1,4-butanediol)-diacrylate-β-5-polyethylenim-ine] PDHA: poly[(1,4-butanediol)-diacrylate-β-5- hydroxy amylamine]; VER: verapamil; DSF: disulfiram; ATO: arsenic trioxide; Cyto c: cytochrome c; GSH: glutathione; PPE: polyphosphoester; PEI: polyethylenimine; PLK1: polo-like kinase1; MMP: matrix metalloproteinase; TPGS: d-α-tocopherol polyethylene glycol succinate; PTT: photothermal therapy; NIR: near infrared; PDT: photodynamic therapy; Ce6: chlorin e6; OPV: oligo(p-phenylene vinylene); ROS: reactive oxygen species; aHCSs: hollow carbon nanospheres; NO: nitric oxide; SFNs: silk fibroin nanoparticles; MNPs: magnetic Fe3O4 nanoparticles; MBs: microbubbles; CSCs: cancer stem cells; PFC: perfluorocarbon; ATLP: acidity-triggered ligand-presenting; PDPA: poly (diisopropanolamino ethyl methacrylate); PA: photoacoustic. The National Natural Science Foundation of China (81521005, 81630052, 81690265), Key scientific research program of CAS (QYZDJ-SSW-SMC020) for financial support.